In the first game of the second match-day, host nation Russia met Egypt in St. Petersburg. Russia came into the match knowing that a win would all but seal their ticket to the knockout stages of the competition, whilst Egypt knew they needed at least a draw to keep their qualification hopes alive. This hope was fuelled by the return of Mohamed Salah to the line-up, who missed much of Egypt’s preparation for the World Cup and their first match against Uruguay through injury, whilst Russia made two changes from their 5-0 win over Saudi Arabia; Artem Dzyuba for Fedor Smolov,and Denis Cheryshev for the injured Alan Dzagoev. Russia were the better team from the get-go. In their opening match against Saudi Arabia, Russia’s full-backs were a primary outlet as part of their low-risk build-up play from the goalkeeper. It was even lower risk in this match because of the limited pressure on Russia’s full-backs, especially on the left side. 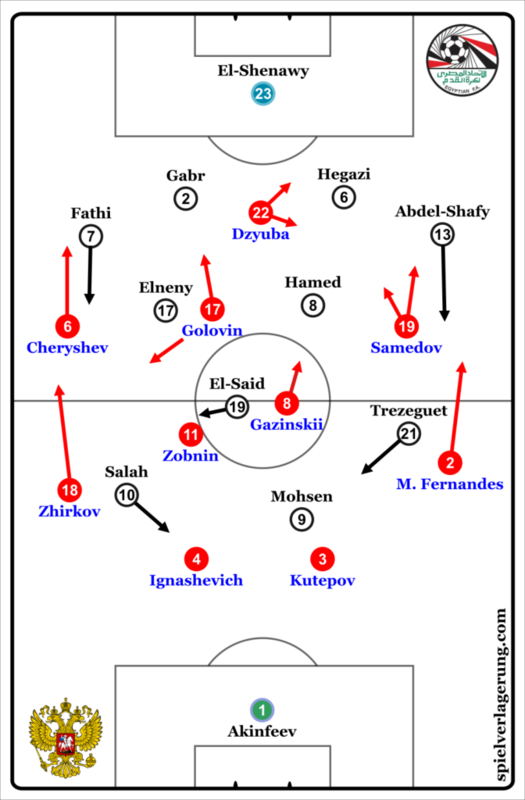 This was because of Salah’s tendency to move inside to a more advanced, central position, meaning that when Russia regained possession there was regularly space for Zhirkov to receive possession and advance into Egypt’s half. The risk that Egypt were taking here was that if they were able to win possession back, they could use Salah as a counter-attacking outlet, who was almost playing as a second striker. His advanced positioning when Egypt were defending meant that he would have provided an immediate threat to Russia’s defenders and the space in behind them if the ball could get to him. However, this risk didn’t pay off for Cuper and Egypt, as finding Salah after regaining possession for swift, vertical counter-attacks was more of a fantasy rather than reality. There was time for Russia’s defenders to recover into more appropriate positions when Egypt regained possession and played long passes forward. This was because Egypt took too long to physically play these passes, or because the actual time it took for these passes to reach its intended target was too long for them to remain open to receive them. The reality was that Russia frequently progressed and overloaded Egypt on both wings, particularly on the left side as a consequence of Salah’s defensive positioning, with combinations between Zhirkov, Cheryshev and Golovin. Golovin maintained his influential role in Russia’s attack from their first match against Saudi Arabia, playing in a more central #10 position. Along with the emergence of Cheryshev on the left wing, Dzagoev’s injury against Saudi Arabia can be seen as a blessing in disguise. In terms of Russia’s defending, Golovin joined Dzyuba as a second striker to create a 4-4-2 pressing shape. They didn’t press Hegazi and Gabr when they had the ball, instead using their cover shadows to directly man-mark Egypt’s central-midfielders Elneny and Hamed. This meant that any attempt Egypt might have made to play out from defence and through the midfield was squandered before even attempting to do so, instead opting to play long passes towards the forwards. Russia’s central-midfield was slightly staggered when Egypt’s defenders were in possession, where Zobnin on the left side operated slightly deeper than Gazinskii on the right side, most likely because of the threat Salah posed in the right half-space. Because of Egypt’s limited capacity to play through the middle of the pitch however, they were rarely able to reach Salah in these areas. Egypt were very poor at defending inside their own penalty area, a cause of all three Russian goals, but their main issue was a real lack of structure in their attacks, with their strategy almost being hit and hope that one way or another the ball will end up at Salah’s feet in a dangerous position. When threatening Russia’s penalty area, many Egyptian players made poor decisions on the ball, often playing wasteful passes when Salah was an open passing option, which was seldom come in this match. Egypt’s superstar didn’t have many goal-scoring opportunities. Even though he wasn’t fully-fit, Egypt looked most threatening when Salah had the ball, even though he didn’t have any clear-cut chances. The intensity and attacking intent from Egypt soared when they were 3-0 down (as you would expect). There were a number of issues in their approach however, such as Salah being moved to striker when Warda was subbed on to play right wing. When chasing the game, Egypt’s attacking approach was to repeatedly cross the ball into the box, which is certainly not how to utilise Salah. Nevertheless, the attacking intent was there, and you can’t help but wonder if Egypt would have been better off playing with a more attacking approach from the beginning of the tournament. Cuper has been criticised by Egyptian fans and media because of his overly-defensive approach, which is sure to continue. The lack of an actual attacking strategy at this level of competition, not even in an attempt to get the best out of Salah, is a real disappointment. This was a low-quality match, with Russia being the better of two poor teams. Salah’s goal was merely a consolation, and his injury killed Egypt’s chances of qualifying from the group stages, which is a great shame when it’s considered what could have been. Cuper was right when stating that Salah missing the majority of Egypt’s preparation for the World Cup was difficult for the team to deal with, but his lack of attacking design is more at fault for Egypt’s lack of success at this tournament thus far. Russia’s stark changes in approach from qualifying to the World Cup (e.g. changing from a back five to 4-2-3-1) has led to a stark turnaround in form. It should be noted that in both of Russia’s matches so far, they have played two quite poor defences, but three goals in seventeen minutes against Egypt have sent the host nation on their way to the last-sixteen, despite being the lowest ranked team in the tournament.